Some of us are shower people, and some are bathers. But there's a way to be both, as the Japanese discovered centuries ago when they developed the ofuro, or soaking tub. Traditionally, the Japanese get clean with a shower or hand bath and then step into an "ofuro," a deep tub full of clean hot water. 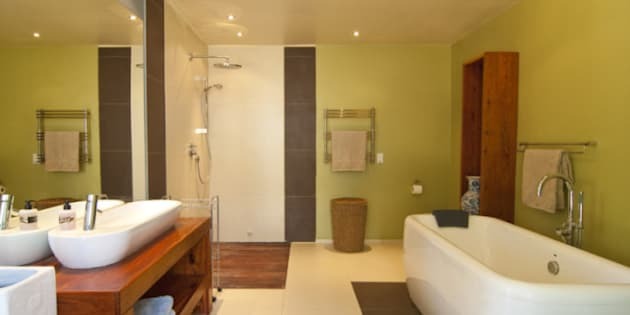 These tubs are often large enough that several family members can have a communal soak. It's considered a relaxing and important ritual. The idea has caught on here, and there are now several manufacturers making ofuro tubs suitable for one bather or a couple. Usually about 27 inches deep, the tubs typically have built-in seats, and often a grab bar. They're available in acrylic, composite, wood, even stainless steel and copper. Bill Finlay owns Sea Otter Woodworks in Haynes, Alaska. While he'd been making outdoor hot tubs for a few years, he made his first ofuro at the request of a business associate, and that sparked an interest in perfecting the craft. "I made a couple of fact-finding trips to Japan, then developed my own techniques," he says. Finlay makes the Hinoki Ofuro in a couple of sizes, suitable for one or two people. The material is an aromatic cypress native to Japan; the resin is bacteria- and rot-resistant and withstands humidity. The citrusy fragrance is a common aromatherapy component. Wykoff, N.J.-based bath designer Holly Rickert recently won an industry award for a design that incorporated an English soaking tub into a Japanese-style bath. One of her clients was of Japanese heritage, and had given her some brochures from Japanese hot spring spas. She placed the tub, Cabuchon's curvy Pleasance Plus model, on a bed of river rocks in front of a window with forest views. "My aim was to replicate the ofuro experience for her," says Rickert. Made of a proprietary solid composite called Ficore, Cabuchon's tubs aren't heavy. The maker says they retain heat better than most acrylics, don't chip and can be custom colored. Kohler makes the Greek acrylic soaking tub, a 4-foot-long, 23-inch-deep, one-person bath well-suited to a smaller bathroom. Kallista's Perfect Deep Soak bathtub has two raised corner seats at different heights. Diamond Spas in Frederick, Colo., welds recycled copper and stainless steel into tubs that are lined with foam insulation, then buffed to a nice Old World finish. Like kitchen pans, the copper tubs can be left to develop a patina, or rendered shiny with a polishing compound. Soaking tubs aren't as complicated to install as you might think. If you're putting in a smaller, one- or two-person tub, you'll actually use less water than a conventional tub. But a four-person version can hold a lot of water — close to 250 gallons, compared to around 50 for a conventional tub. So floor joists need to be able to hold the weight of the water, not just the tub. Also, make sure you'll be able to get the tub sideways through doorways. Many tubs come with an overflow failsafe built in, but you should have a drain in the bathroom floor as well. The river rock bed is an attractive way to hide a draining floor system, but you can also tile the bathroom floor and install a drain. You'll need lots of good hot water, so upgrade your system, and consider an inline heater that continuously reheats the full tub. There are jetted options for many of these models, if you'd prefer some bubbles with your soak.